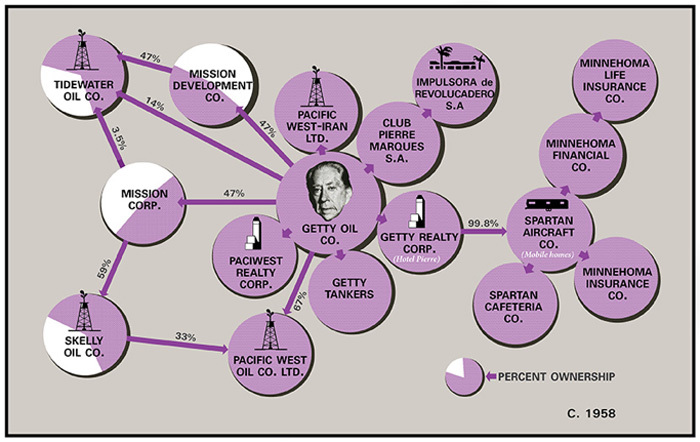 Who was J. Paul Getty? How did he make his money? Why did he build a museum? Did he live there? Why is there no entrance fee to the museum? These are just a few of the many questions from visitors that inspired the new installation at the Getty Center, J. Paul Getty: Life and Legacy. 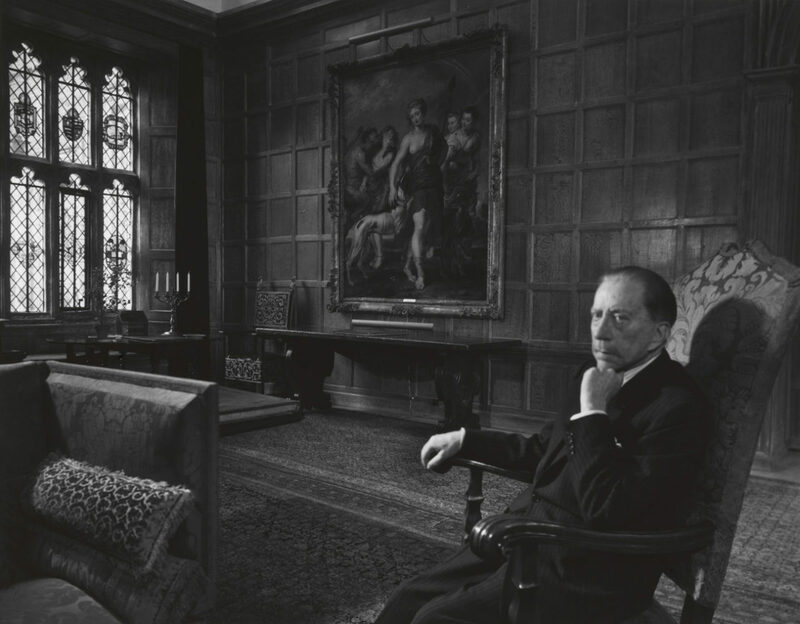 Our founder, J. Paul Getty (1892–1976), was an avid art collector and ambitious businessman, who left the vast bulk of his fortune to establish “a museum, gallery of art, and library for the diffusion of artistic and general knowledge.” But, other than on our website, the J. Paul Getty Trust had not previously shared Mr. Getty’s story with visitors to our two sites—the Getty Center in Brentwood and the Getty Villa in the Pacific Palisades. Addressing their questions about Mr. Getty in the context of a physical display thus raised several questions for the team of staff working on the installation: Where can we tell this story? What artworks should be presented? What is the right tone for this story? How do we share such a broad history in an accessible, yet detailed way? As the lead designer and a curator on the project, I was also particularly interested in how to create an experience that was both informative and fun; that would hold up physically and conceptually over time; and that was flexible so we could update it over time and respond to things we observe and learn from the visitor’s experience. We decided on the 40th anniversary of his death in 1976 as the target date to debut the story of our founder. 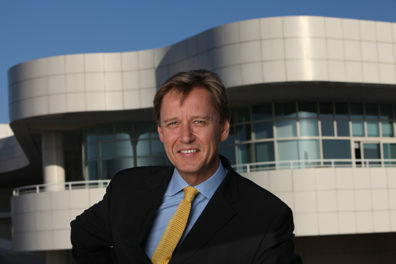 The establishment of the J. Paul Getty Trust and its constituent programs (the Getty Conservation Institute, the Getty Foundation, the J. Paul Getty Museum, and the Getty Research Institute), the creation of the Getty Center in Brentwood, and the continued growth of the collection after Mr. Getty’s death through today. The first question to answer was where we could tell this story. 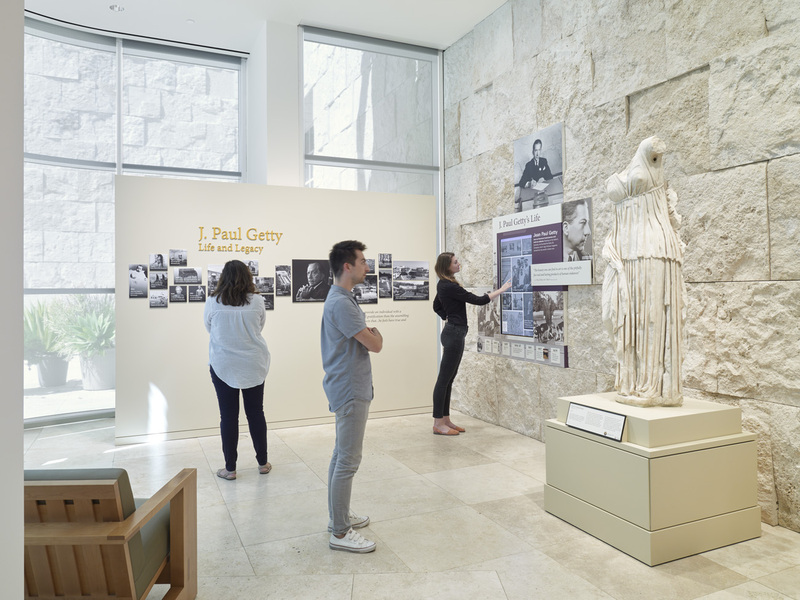 Since the opening of the Getty Center in 1997, there has been a bust of J. Paul Getty displayed in the Museum’s Entrance Hall, but that space doesn’t allow for a full presentation of his life. We decided that the installation would be located at the entrance to the Museum’s French decorative arts galleries in the South Pavilion. Not only does the space serve as the gateway to one of Getty’s favorite collecting areas, but it would also offer a good entry point for visitors using the mobile audio tour as it leads directly into the South Pavilion galleries, which display artwork Getty himself acquired as part of his personal collection. Writing this story was a big and complex endeavor—too substantial for just one person or a single department. Plus, we had decided early on to present the story as an innovative interactive experience—a design solution for fitting a big story into a small space—which meant we needed representation from different areas of expertise from both inside and outside the institution. The work was supported by over 100 staff members from across the Museum (Curatorial, Design, Education, Rights and Reproductions, and Interpretive Media, to name just a few) as well as colleagues at the Institutional Archives (housed at the Getty Research Institute). Also working behind the scenes was staff engaged in a huge effort to digitize all of the photographs and documents that appear in the digital component of the installation. These are managed through a bespoke content management system that provides tools to write, edit, and manage assets (image, audio, film, text), and to publish and update content on the large touch screen monitors in the gallery. Our content goals for the installation gave us a framework for telling the story in four main chapters: J. Paul Getty’s Life; Antiquities and the Villa; Getty Collecting; and Getty’s Legacy. The chapters tell the biographical story of Mr. Getty and the origin story of the Getty Trust through a combination of text, images, audio and film clips, and documents. These include never-before-seen film and photographs that were discovered through our research. 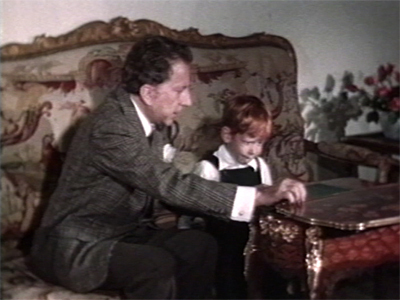 For instance, in a clip from the film At Home with Mr. J. Paul Getty (1950), you can see Getty exploring an 18th-century mechanical table with his son Timmy. We selected artworks acquired by Mr. Getty to be featured in the gallery, which we chose for their quality and their importance to him, as evidenced in his diaries. 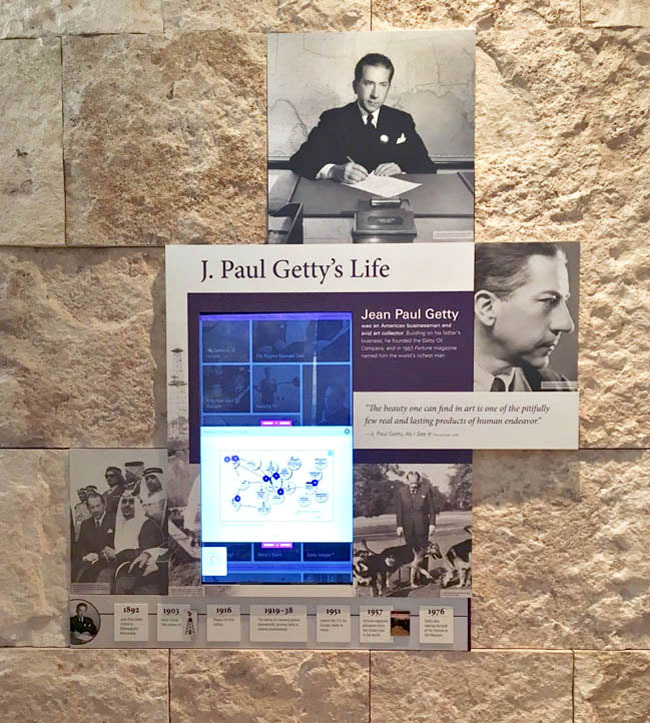 We wanted to create the effect that the story of Getty’s life and legacy is part of the fabric of the building, so we removed travertine stone panels from the walls, and the graphic panels and touch screen monitors were embedded in their place. We designed the graphics and texts to be simple and easy to read. Some of the more complex graphics are inspired by mid-20th-century magazine graphics, the sort that were used during Getty’s lifetime. During the development process, we used the Sunday newspaper as an analogy for imagining how the audience could interact with the presentation. As with the newspaper, you can skim headlines till you find something that interests you, or you can read it cover to cover if you have the time and inclination. The interactive touch screens allow visitors to browse quickly through a few stories, or to stay for an extended time and access hundreds of anecdotes, images, videos, information graphics, and audio recordings. To encourage visitors to take their time, we also installed comfortable seating along a window wall. The perfect time to visit is in the late afternoon, when the space is aglow in light. Complementing the installation is a mobile audio tour featuring 12 objects that Mr. Getty personally collected and that are currently on view in adjacent galleries. Through texts, audio, and film, you can hear him discuss the objects and learn about how they were important to him, and about their place in the Museum’s collection. We’ve been thrilled by visitors’ positive reactions to the installation so far, and by their interest in exploring J. Paul Getty’s life and legacy. If you visit, we’d love to hear what you think! I’m the head of design at the J. Paul Getty Museum. I was at the Getty museum last week, October 25th, 2016. It was a pleasure to see school busses full of kids enjoying the museum and gardens. Wish we had more free museums throughout the world and more art classes in schools. The J Paul Getty: Life and Legacy is a wonderful exhibit of a man who wanted everyone to share the art and the treasures with the world and as he commented “My love of fine art increased the more of it I saw the more of it I wanted to see.” Job Well Done to everyone involved who brought his legacy to life. I HAVE BEEN TO THE GETTY MUSEUMS SEVERAL TIMES IN MALIBU, LOS ANGELES, CA. I LOVE GETTY MUSEUMS , THEIR HUGE AND HAVE LOTS OF ROOMS FILLED WITH HISTORY. AND EXHIBITIONS FROM ALL OVER THE WORLD. 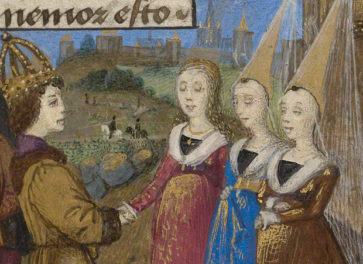 I LOVE TO VISIT THE GETTY MUSEUM IT IS ONE OF MY FAVORITE MUSEUMS. On the afternoon of Wed 29 Nov 1967 i was in Christies saleroom . The place was virtually empty , in walked Paul Getty with a blonde lady wearing a Burberry mac . ( it was a sunny and showery day ) Mr Getty left his companion and gazed for 5 minutes at a wonderful Monet that was coming up for sale (La Terrasse a Sainte Addresse ) The following Friday the picture sold for 588000 guineas and ended up in the Met. In hindsight i wish i had encouraged Mr Getty to buy it !